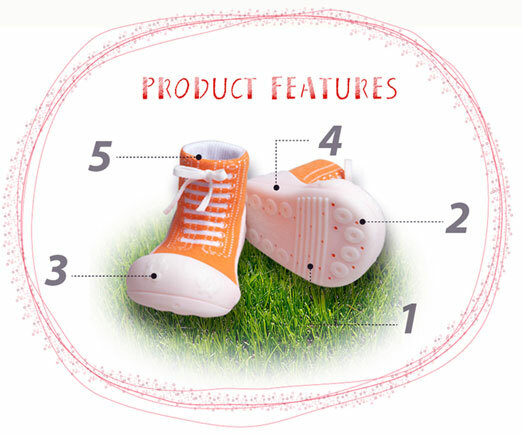 Attipas toddler shoes are based on 7 years of kinetic and physio-dynamic research of toddlers walking, these unique non slip shoes ergonomically support a infants first steps and thereafter. With university, industry and educational cooperation, we are proud to introduce these internationally patented toddler shoes to the market. Attipas shoes are The Fun of Learning to Walk. (1) Convenience - Durable, non-slip, machine washable, fast drying. (2) Breathable: Perforated sole releases heat and moisture for added comfort. (3) Large Toe Box: Free toe movement for improved cognitive & motor development. (4) Safe: Built with non toxic safety tested materials. (5) Lightweight & Flexible: Super lightweight, just like wearing socks!